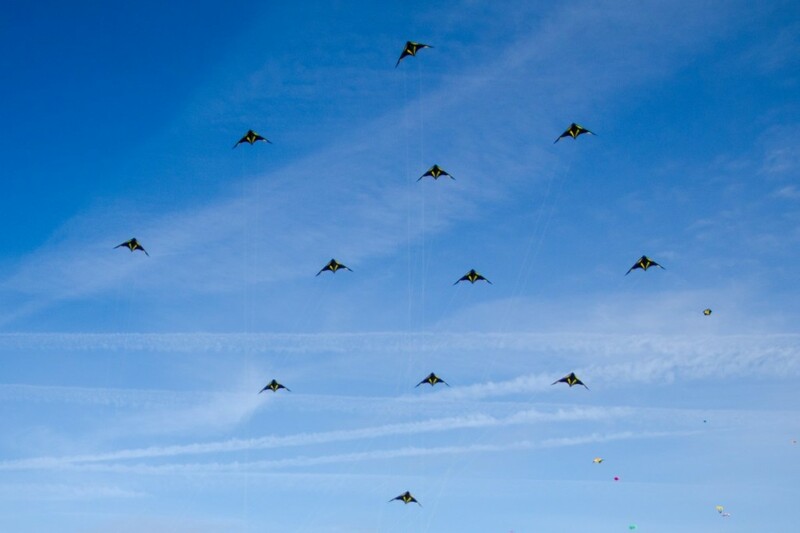 World Sport Kite Championships is back with a 14 team contest featuring representatives from 9 Nations. In the previous 8 editions, three teams, Overdrive (France), Cutting Edge (USA) and Scratch Bunnies (UK) have each won twice each. Can Scratch Bunnies create history by winning the World title for a third time? Or will Air-Rex, back after a long absence be able to join the ranks of two-time winners? Will there be a new name on the trophy in 2014. Here, KiteLife Magazine casts an eagle eye over the “runners and riders”. It’s great, at last, to welcome a team from China to WSKC. 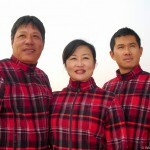 Flying as a 4 man team in the 1st Asia Pacific SportKite Championships in 2012, Team Win-Sky Shanghai coped less well with the rigours of compulsory figures. However, thanks to their own enthusiasm and hard work plus expert coaching in their own country from top Japanese competition flyers, they now have a better understanding of figures and two more years’ experience of flying together. They now fly as a team of 3 and their well-choreographed ballet demonstrations were one of the highlights at the Bintulu (Sarawak) International Kite Festival in 2013. They have an interesting vented kite, designed by team-leader Jackie Chen and are likely to have ample opportunity to use it in Berck! Malaysia, who last sent a representative team to WSKC in 2004 are back after a long absence, this time represented by Team Silat who are all members of the Bintulu Kite Flyer Club. They bring a strong team of 5 flyers including father and son, Pian and E-June Sophian. Team Silat gained a good second place in the 2012 Asia Pacific SportKite Championships where they impressed with well-choreographed ballet performances and a good understanding of the compulsory figures. If the winds in Berck stay at the light to moderate end of the scale, Team Silat could cause some surprises. However, in Sarawak they have little opportunity to practice with their vented kites. If the winds are strong, they will need to acclimatise quickly. Equipo Bogota 2600 from Colombia will make the longest trip to Berck and this will be their 5th WSKC. They have been making steady progress up the rankings, especially since the addition of a fourth team member in 2012, where they placed 8th, beating of off some well-respected European teams in the process. 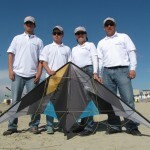 They have extensive international experience and have been great ambassadors for kite-sport in Colombia over many years. They have the skills to deal with whatever wind conditions Berck may provide and will be looking to capitalise on their knowledge this time. France will be fielding 4 teams of whom the strongest, on previous form, is undoubtedly Start’Air. They made an excellent debut in 2008 placing 7th and since then have consistently impressed the judges with their tightly choreographed ballets and well-disciplined precision performances. The addition of a fourth pilot, Alexandre Ziegler (formerly with Team O4) in 2012 opened up new choreographic possibilities for them and with two successive WSKC third placings to their credit, they will undoubtedly be looking to improve on that in 2014. Rumour has it that they are preparing a new ballet which will hopefully be unveiled in Berck. Little has been seen of the Dealers team from Lithuania since WSKC 2012 as they were unable to take part in the 2013 European Championship. At WSKC 2012 they placed 12th and perhaps their inexperience showed at that stage, however with the same team, led by Jurgis Pauliukas, and a further two years of flying together under their belts, they will be aiming for better things in 2014. Harsh winters in Lithuania mean that flying practice time is restricted, though recent photos on Facebook suggest they have been honing their routines with stick practice. 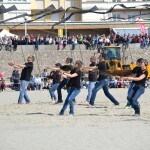 les Mademoiz’Ailes (then known as CV Folie Filles) were present at WSKC 2012, taking part in the ballet section only. This time they will be taking on the full rigours of WSKC competition. They are the only all-female team in this competition and in Europe. Capably led by Sabrina Gruson, these ladies are very much dedicated to their sport and put in a lot of practice hours. Their regular training ground is on the Normandy coast in Ouistreham so they are well accustomed to the conditions that they will meet in Berck. They have one recent team change with Estelle Moulin replacing Ludivine Maton. 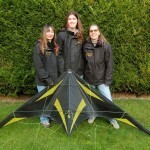 Ouistreham is also home to Team Cerf Volants Folies, who were the surprise package at WSKC 2012, finishing in a very creditable 5th place overall at their first attempt. Flying with a team of 6 pilots in ballet, their performances in 2012 were well drilled and impressed the judges with choreography that was very much in harmony with their chosen music. CV Folies have an unchanged team for 2014. However, team-leader Jeremie Maton was sidelined by emergency surgery towards the end of 2013. It remains to be seen whether this, and recent extreme weather conditions across Europe will have upset their practice schedule. Again, KiteLife Magazine hears rumours of a new routine for 2014. 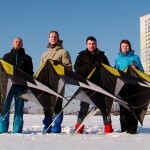 The Russian team Red Alert were perhaps a little unlucky on their first visit to WSKC in 2012 but demo performances at the 2013 Berck International Kite Festival will have added valuable experience. The emergence of Russian competitors on the world sport kite stage was amply demonstrated at the 2013 STACK European Championships (Eurocup) in Cervia, Italy where Mike Loskov and Timour Bourbaev took Russia’s first ever European title in the multiline pairs discipline against some very well-respected opposition. New recruits since 2012 are Olga Bednova and Slava Mischenko who replace Timour Bourbaev and Alexander Malaev. Despite recent Moscow temperatures of -22c, Red Alert have been putting in a lot a practice over the winter months. Maybe a surprise package in store? 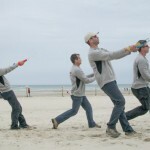 Pair Evidence from USA (Scott Davis & Toby Arndt) impressed the crowds at Berck 2012 with some high-energy, trick-loaded pairs demonstration flights. For WSKC 2014 , Scott will be back leading Evidence the team, this time assisted by Kristian Slater and this year’s youngest competitor, Travis Reedy who will be just 13 when he steps into the WSKC arena. If the style we saw from Pair Evidence is reflected in the team performances, we can expect some fireworks in the ballet section! The team is based in Seattle so they will be aiming to replicate the Seahawks 2014 NFL Superbowl success. Team Flame from UK are the only team to have competed in every edition of WSKC to date and current line-up of 3 pilots includes two of the founding-members. They produced a new ballet for the 2013 European SportKite Championships (Eurocup) in Cervia, Italy but it hadn’t quite gelled at that stage. However, the scoring potential was clear to see and, but for unfortunate errors, they might have had a better result. They will have had time to polish their performance before coming to Berck and, armed with the experience that tends to show up well in the compulsory figures and precision section, they could also be poised to spring a surprise or two. 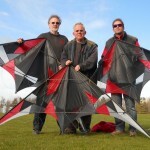 A change of kites in 2009 helped Cream Team from Chantilly, France to establish themselves as serious contenders on the European sport kite scene. 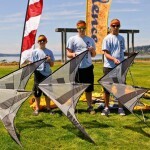 The team were unavailable for WSKC 2010 but made a good impression, placing 9th overall, at WSKC 2012. In one-day competitions they have shown themselves to be capable of overtaking some of the big names though, for WSKC 2014, they will need to concentrate on securing consistently good results throughout the 3 days of competition. The ballet routine they used at WSKC 2012 had been in circulation for a while, so they will be hoping that a new routine will improve their chances. 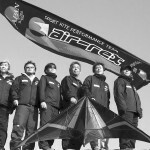 AirRex from Japan have an enviable record in WSKC competition and were clear World Champions in on their last appearance in 2008. They were obliged to miss the WSKC competitions in 2010 and 2012 because of work and family commitments. They are now back for 2014 as a team of 4 flyers, retaining three team members with previous WSKC experience plus AJSKA Chairman Sieiji Kato, who last appeared in Berck as a member of the WSKC 2008 judging panel. However they are without husband and wife Naoki & Rie Tamura for this competition. In past editions, AirRex have capitalised on teams of 5 and 6 flyers to create spectacular ballet choreography. Can they create the same kind of impression with four? Certainly flying techniques and choreographic styles have changed since 2008. 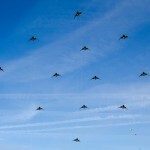 However AirRex have been putting in a lot of practice and will be well prepared. 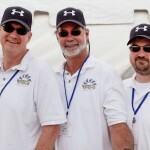 Air Zone Flight Team from USA have taken part in six previous editions of WSKC and bring a wealth of experience. Their best results to date have been two consecutive 4th paces in 2010 and 2012, when they flew as a team of 3 pilots rather the much larger squads they favoured previously. Their experience tends to show up well with close formations and cleanly executed moves in the compulsory figures/precision section. Air Zone look like seasoned professionals and in adverse wind conditions, when other teams might struggle, Air Zone can be relied upon to produce consistent quality performances that should put them in the mix over three days of competition! Reigning double World Champions, Scratch Bunnies from UK will be fielding four pilots with Sasha Reading replacing James Robertshaw in an otherwise unchanged team. A collection of very talented individual flyers don’t necessarily work well as a team but Scratch Bunnies seem to be the exception that proves the rule. They are all competitive individuals and will be aiming to make WSKC history by taking the title for a third time. 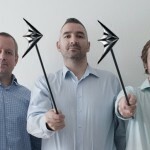 However, the margin of their victory over Red Bull Kite Force in 2012 was less than 2 points over 3 days of competition. Scratch Bunnies are likely find themselves very hard pressed at WSKC 2014 but, rather like Usain Bolt, they always give the impression of having something more in reserve that they could draw upon. Without Red Bull Kite Force in the competition this year, close-contenders from previous editions will feel they have a better-than-ever chance to get their hands on the trophy. AirRex will be eager to prove they can lift the trophy again however they are not the same squad that won previously, but neither are Scratch Bunnies! France have not had a winner since Element’Air in 2004. The leading French teams have settled squads and will be accustomed to the conditions but new ballets will need to come together quickly. Battle will most definitely be joined on Day 1 when the draw for starting order has five teams with previous top-5 placings entering the ballet arena in succession, hotly pursued by three newcomers, all eager to establish themselves as 2014 top-rookies. Also joining in the fun, in a separate daily head-to-head “Concours de l’Avenir” competition are Atemoc from Colombia, who placed 12th on their last WSKC appearance in 2008 and are eager to re-establish their credentials, versus emerging French team Panam’Air. Atemoc will have the edge on experience but Panamair, who are based in Paris, travel regularly to Berck in order to get good wind for their practice sessions and will be more accustomed to the conditions. KiteLife Magazine wishes good luck and good winds to all the teams and “bon courage” to judges Lisa Willoughby and Ron Despojado (AKA), Pascal Martel (FFVL), Giancarlo Galli (STACK Italia) and Andrew Taylor (STACK UK) also to Mary Ann Parker (STACK UK) who takes charge of her first WSKC as Field Director and Susan Skinner (AKA) as she wrestles with the scores and the judges’ handwriting! 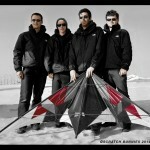 This entry was posted in KL Archive and tagged berck, featured, sport kite, team, World Championship.